Patrick was born c.1883 in Derryveagh, between Newtowncashel and Kenagh. 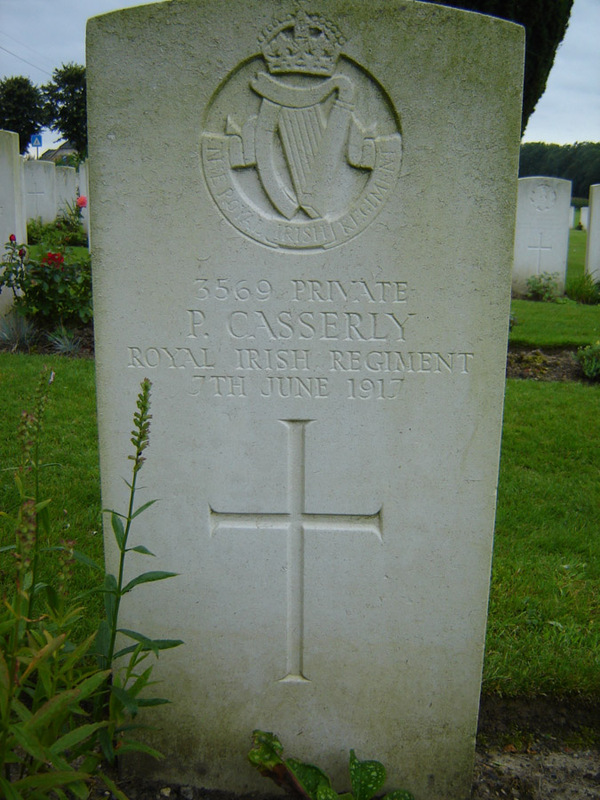 Pte Casserly enlisted with the Royal Irish Regiment in Londonderry, Co. Derry in May 1915 and was posted to France in December of the same year. Patrick was one of six Longford men who died on the opening day of the Battle of Messines on the 7 June 1917, where the 16th (Irish) Division and 36th (Ulster) Division fought side-by-side. Son of Patrick Casserly and Catherine, Derryveagh, Kenagh, Co. Longford. Born in Newtowncashel according to army will. Patrick was originally buried in Danzig Alley British Cemetery, 3.5 miles east of Albert, but was exhumed and reburied at Wytschaete in 1920.